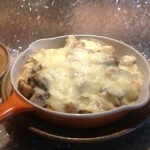 Tartiflette is a traditional French dish with potatoes, cheese and bacon. Perfect for lunch, supper, mid week dinner, when you need a comforting dish, this will foot the bill. The recipe usually uses slices of potatoes, however I didn’t have any potatoes, but did have some gnocchi in the fridge, so I thought, ok, a great substitute. I gathered together the ingredients, gnocchi, lardons (bacon bits), cheese, onions. I was looking forward to the results. I started by frying off the lardons/bacon, transferred them to 2 individual dishes, then added the gnocchi to the frying pan and cooked them through getting some colour on each of the little balls of fluffy potato, then I split them between the dishes and then cooked the mushrooms and onion, again just cooking them through, as once the dish was put together, I would be placing them in the oven to melt the cheese, I mean can you taste it already, melted cheese, oh yes. I mixed the ingredients together and then tossed the Reblochon cheese through the mixture, tucking some little bits down in between the gnocchi and mushrooms. The final flourish was a covering of grated cheddar, perfect. 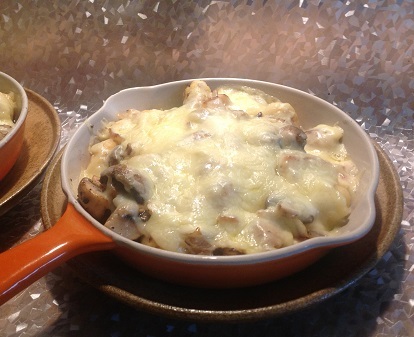 I placed the dishes onto a baking tray and it was into a hot oven, to warm up the gnocchi, lardons, mushrooms and onions and best of all to melt the cheese :-). Then it was the waiting, that was the killer, but not too bad, 15 minutes and it was hot and bubbling and ready to eat, delicious. I promise you will love it, I know I did, and by the way so did my hubby. Heat the oven conventional 220 c/fan 200/gas 7, Place 2 dishes on a baking tray. Fry the lardons in a frying pan until cooked through and a little crispy. Transfer the cooked lardons into the dishes. Leaving as much of the fat in the frying pan. Toss the gnocchi into the frying pan and cook until they are warmed through and have a little colour on all sides. (5 minutes). Remove the gnocchi and split between the 2 dishes. Cook the onions and mushrooms in the frying pan, add a little vegetable oil if required. Transfer to the dishes. Using a spoon, mix the contents of the dishes and arrange so all the ingredients and mixed together. Cut the reblochon cheese into small slices and toss through the contents of the dishes, tucking the cheese in between the gnocchi so it will melt through. 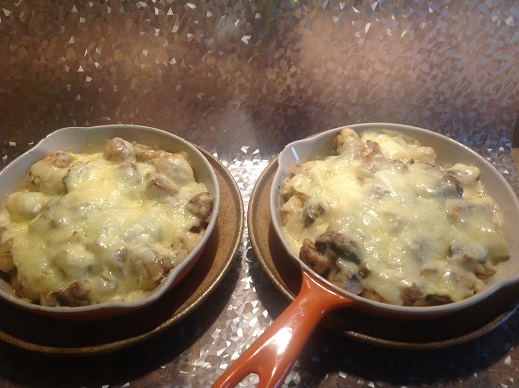 Then top with the grated cheddar cheese and place the baking tray in the oven. When the cheese is bubbling and melted about 15 minutes. Remove the baking tray from the oven. Transfer the dishes to heat proof plates before serving. If you can not find reblochon cheese you can use any soft cheese like brie and camembert. Just experiment, there is lots to love with melted cheese.